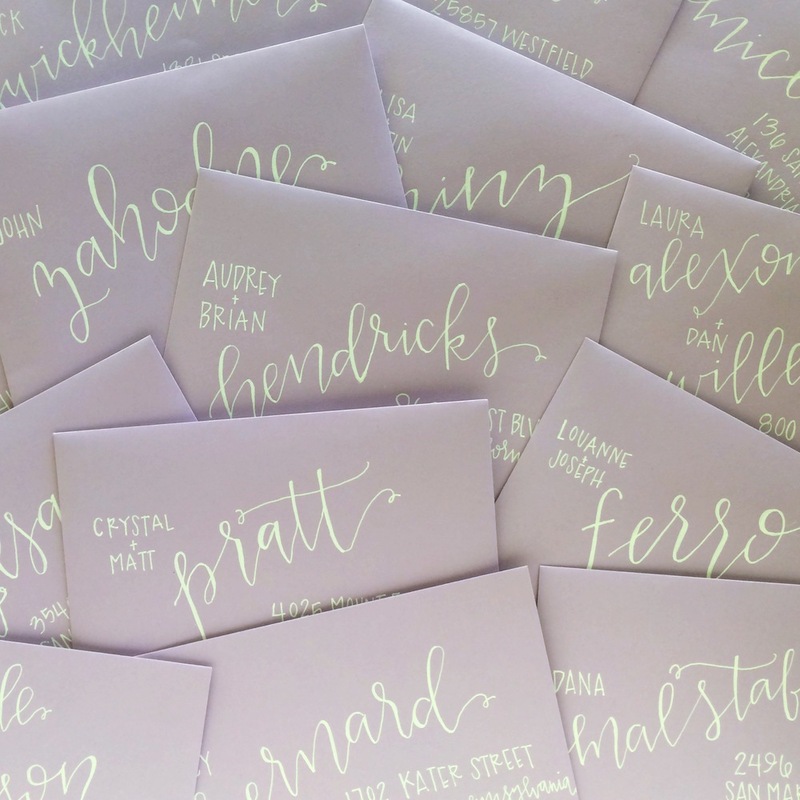 Show your guests your great style with some custom lettered envelopes! I have a number of styles and we can find one that works best for your event. This let’s me know what you are looking for! I will email you back within 24 to 48 hours to discuss any questions you might have. Please fill out my custom design questionnaire here! Once we’ve figured out what you are looking for, I will create a comprehensive price quote and project timeline for you to review! I can write on your envelopes (be sure to order 20% extra for goofs or changes) or I can purchase envelopes for you. If everything looks good, then you will make your deposit (via PayPal or custom Etsy listing) and the magic happens! After you make your deposit, I will create some samples for your envelopes depending on your style and we'll decide what works best for your event. At this point, I will need you to send me a list of the addresses you want lettered exactly as you want them formatted. I can send you a worksheet for address etiquette to help you with this process! This will also be the time to ship me your envelopes. Once I receive your envelopes and addresses, I'll get to lettering! The process is usually about one week (for 100) but can take up to four weeks (depending on how many envelopes you need). I like to send pictures to update you on the progress! STEP 5 | YOU GET YOUR ENVELOPES! Once I’ve finished lettering, I will let them dry, proof them, pack them up all pretty and send them on back to you! If you would like me to stuff and stamp the envelopes (there is an additional charge for that), then I can send them out to your guests!